Android now has been the hottest and widely used operation system over the world and we can see lots of brand mobile phone support this system such as HTC, Samsung, Sony, LG, HUAWEI, ZTE etc. Many consumers nowadays prefer user-friendly Android OS and give high valuation. It’s apparent that it will promote the enlargement of Android market, and also more and more Android management software’s are naturally designed and developed to offer the effective solutions to solve the problems coming out during the application. Images stored in your Android device internal and external memory can be deleted accidentally or mistakenly. Like, sometimes, you just can remove some important pictures when your fingers are operating quickly on the screen interface, and it’s easy to make this mistake, even though you never think of doing this. Except for the human mistakes, the damage of memory card also will lead to the loss of data. In addition to this, if you happen to format the SD card in your phone, the images saved in it can be deleted by your action. However, there is one case that is totally out of our control: while you are transferring your photos to your computer or other devices, suddenly the power is off, or other interference happens, the photos might be destroyed completely, even deleted. The more we were aware of the significance of all missing photos, the more sadness and regret we would hold. And certainly wish that if some way can get back the information that would be excellent. With it, you can recover what you want from Android devices without taking out the SD card or TF card inside your phone. It will perform a deep scan on both your phone’s internal memory and external storage drive. Click the below button to download the right version for Android photos Recovery, just try this tutorial to recover deleted or lost photos from Android phone. 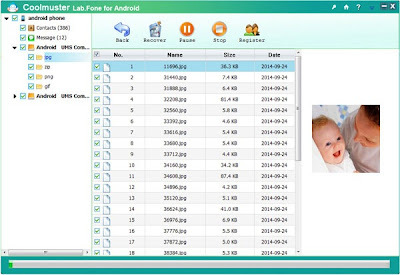 Coolmuster Lab.Fone for Android is such software which is useful to recover the photos from Android phone. As we know that losing precious pictures is quite common and really annoyed, so indeed we need the recovery program to help us recover our important images. Related: See Wondershare MobileGo for Android review. 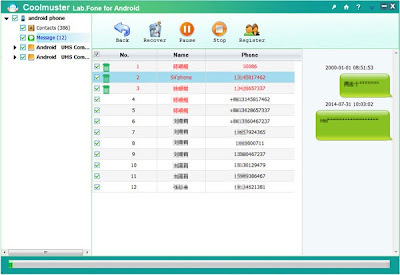 Coolmuster Lab.Fone for Android can make it possible as it enables to retrieve text messages, contacts, photos, videos, files and other lost documents saved in the Android devices. When you need to recover your text messages from Samsung Galaxy or Note phone. Coolmuster will show great performance in recovering lost text on Samsung Galaxy. It’s said to be the perfect solution to recover all the deleted images for Android users, with the advantage of restoring data in the most rapid and convenient way. Users simply need to finish several clicks, and then the stored data including the existing and lost one will be scanned waiting for easily selection and recovery. The software offers the best assurance of the data quality, that is, the information you choose to regain will be 100% keep the same as it is, no damage, and no modification. Being free-risk, offering useful functions, Coolmuster Lab.Fone for Android is becoming the best assistant for the Android supporters. Helps you to recover multiple file formats: Yes, you heard it right. You can recover any file that is saved onto your SD card. Be it image, video, document, pdf, etc, you can get them back with one click. Even if your contacts gets deleted, you can get it back with this software. It stores them in one CSV format, which contains various fields like name, email, number and any other fields which you have used. Safe recovery: Don’t worry, this software is 101% safe to use. It doesn’t cause any damage to your SD card like other software’s. Easy to use even for non-tech type people: You don’t need to be an expert to use this software. There are simple options present, so that any user with little computer knowledge can use it without any hitch. Compatible with latest Android versions: You can use this software to backup data on any Android device, irrespective of manufacturers like HTC, Samsung, up to Android Kitkat.